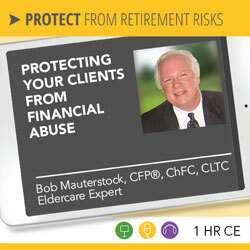 Bob Mauterstock, CFP®, ChFC, CLTC, is an accomplished speaker, author and sought after authority on the financial concerns of baby boomers and their adult children. For over 35 years, Bob has helped families achieve a worry-free, comfortable retirement. He has inspired baby boomers and their adult children to give each other the gift of communication and preserve their legacy for future generations. In 1987 he qualified as a Certified Financial Planner® and became a specialist in retirement income planning, long term care planning, investment management and legacy planning. In 2009 he sold his practice to a regional accounting firm, which was then transferred to Kevin Leahy, CFP®, who established Connecticut Wealth Management, LLC in 2010. In 1987 Bob qualified as a Certified Financial Planner® and became a specialist in retirement income planning, long term care planning, investment management and legacy planning. In 2009 he sold his practice to a regional accounting firm, which was then transferred to Kevin Leahy, CFP®, who established Connecticut Wealth Management, LLC in 2010. Bob speaks to a wide range of audiences through workshops, trainings, meetings, and consultations, as well as doing presentations for organizations and corporations. You can read more about Bob and his work on his website and through his blog on GiftofCommunication.com. Elder financial abuse is a growing problem creating annual losses to families estimated to exceed $2.9 Billion per year. As retiring boomers become part of this population the problem is expected to increase dramatically. It is critical for financial advisors to be aware of recent legislation that will affect their ability to deal with this crisis, and understand the steps they can take to help their clients avoid significant loss resulting from financial abuse. This webinar will give advisors the skills they need to protect their clients. 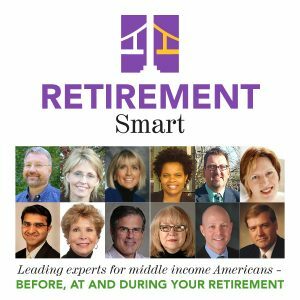 Visit Retirement Insight & Trends for a summary of this presentation. How can I protect myself and my family from elder financial fraud? Bob Mauterstock is the author of Can We Talk? A Financial Guide for Boomers Assisting Their Elderly Parents, Passing the Torch, Critical Conversations with Your Adult Children, and Financial Advisor Safeguard Volume 1: How to Protect Yourself, Your Practice and Your Aging Clients Who Have Diminished Mental Capacity. What do you do when you discover that one of your clients has a diminished mental capacity? According to the Alzheimer’s Association, Alzheimer’s disease will strike more than 8 million Americans by 2030 (a rise of 60% from 2010). If you don’t know what steps to take to protect your client and your practice, both may be at risk. Bob has developed a protocol that you can follow to deal with this problem. Attend his workshop and learn the steps you can take to help your aging clients and preserve the business you have worked so hard to build. Boomers are concerned about the conversations they need to have with their adult children about all the issues they will face as they get older. Passing the Torch gives you, as their advisor, a practical and empathetic approach to help them work with their children to discuss and plan all the decisions they will have to make. This workshop lays out the steps to prepare and hold a family meeting to open up the lines of communication. It addresses such critical areas as legal issues that can impact the family, end of life planning, health care planning and passing on a legacy to the next generation. Bob Mauterstock holds a Master’s Degree in Education from University of Connecticut and a Bachelor’s Degree in Psychology from Princeton University. He is a former Navy helicopter pilot and holds the CFP®, ChFC, and CLTC designations. Bob is an active member of the Financial Planning Association. He serves on the Board of Directors for Cape Mediation and the Brewster Ladies’ Library, He is a member of the Academy of Model Aeronautics and the Nauset Newcomers. How can you schedule Bob Mauterstock to speak at your event? Bob Mauterstock is an experienced speaker and presenter with a passion for providing industry-leading information to audiences. Bob is available to speak at your retirement meeting, conference or event. Inquire here about having Bob Mauterstock speak at your conference or event!